When Jason Carter enrolled in New Entry’s Farm Business Planning Course in 2014, he only had a vague idea what he was in for. Coming from a background of software engineering, farming was a brand new world for him. It was conservation that led him to farming. Jason had always wanted to work in conservation, but he had no background in biology or political science; it was software engineering that paid the bills. Then he began to learn about the food system, and the ways in which farms can either work in harmony with the land, or can work to degrade it. He realized that farming was an opportunity, an area where he could contribute to land conservation efforts in a meaningful way while fulfilling his own life goals and doing something that made him happy. Jason and his wife, Val, purchased three plots of land in Phillipston, Massachusetts, and began researching the possibilities for farming them. They were forested and full of rocks – difficult to farm in a conventional sense, but Jason was undeterred. 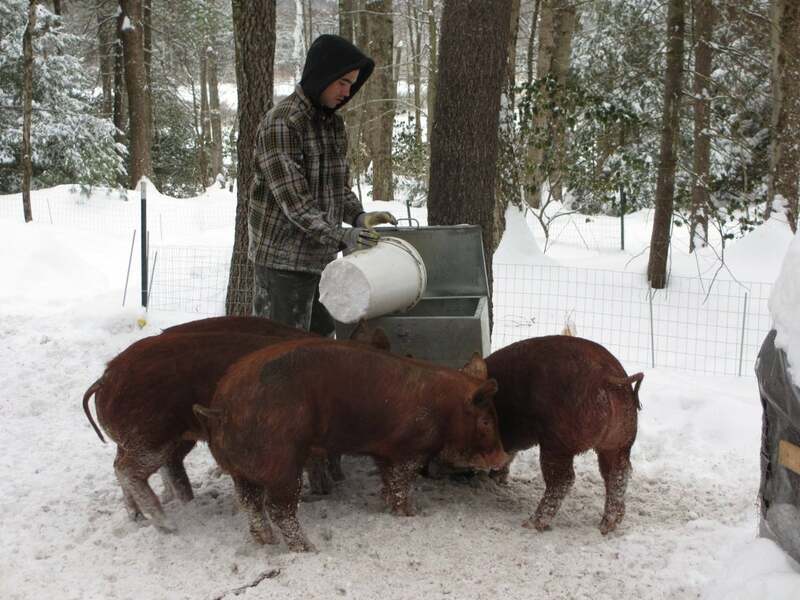 Wanting to preserve the natural landscape, he chose to raise Tamworth pigs, an old breed capable of foraging and thriving in forested spaces, and known for having lean, fine-grained meat. Native to Old Europe, Tamworths are well suited to New England’s climate and terrain – perfect for forested, rocky environments like Jason’s land. Natural Hues Farm was born… but it needed some help. Jason credits New Entry with being his first real introduction to operating a farm. He says that the business planning course “gave me ‘guard rails’ to start getting my farm off the ground”. It helped him get organized, by forcing him to write down his business plan on paper. He adapted the forms and concepts to his unique situation, transferring everything to Google Spreadsheets, a platform he was comfortable with, so he could easily see his balance sheets and keep track of his costs. When asked if he has any advice for fellow young farmers, Jason says that building flexibility into your business plan is important. Customizing the forms he learned how to use at New Entry has helped him make tough economic decisions about managing the farm, and his ability to be flexible has helped him adapt to the challenges any business comes up against. Today, Jason and Val raise primarily pigs and heritage chickens, and have experimented with keeping bees. Their ultimate goal is to expand the pig business while continuing to raise them in a sustainable and ethical way; he would like for Natural Hues to become known as a major organic piglet producer. Since he still works as a full-time software engineer, marketing his products has been a continued challenge. But there have been successes to celebrate, too: Jason is proud of having birthed two litters of piglets, and the farm became certified organic in 2015. “Operationally, I know now that I can do this,” he says, as a result of the business skills he learned at New Entry.